In 1952, Nolan was commissioned by Brisbane’s Courier Mail newspaper to travel to Australia’s far north which was then experiencing a severe drought that impacted on vast tracts of pastoral land, destroying livestock. Departing from Darwin, Nolan travelled across northern Australia, overland and by air, producing a series of paintings, drawings and photographs which vividly express the death and devastation he discovered in these drought-stricken regions. 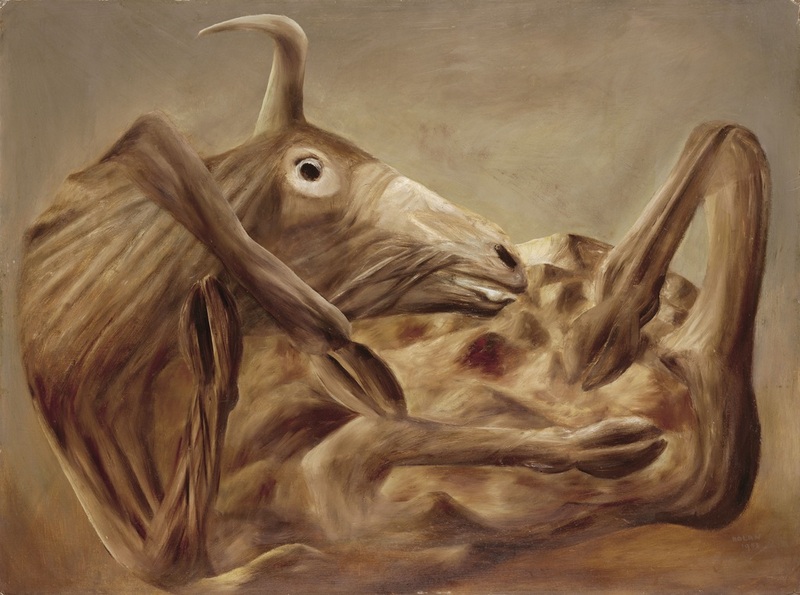 These two works, both painted in 1953 and entitled Carcass, portray the decaying bodies of two cows which are shown twisted and contorted, as if struggling to stay alive. In one work the cow’s distorted and dehydrated body metamorphoses into a landscape that is reminiscent of the paintings Nolan created in Central Australia. Reflecting on his Carcass series, Nolan states: ‘I wanted some indication that life might haunt the vanished bones’ (Lynn, 1979). Evidently, the drought left a deep impression on Nolan. Twenty years later, in 1971, he wrote a poem, also entitled Carcass, which strongly resonates with these two paintings: ‘Screwed up by the sun, held together/ by maggots, dehorned and castrated anyway/ it stands like a rotting ship struck by lightning’. (Lynn, 1979). Lynn, Elwyn. Sidney Nolan: Australia, Bay Books, Sydney & London, 1979, p.116, 118.